I just realised that I hadn't shared my entry for the 3rd Just Add Ink Challenge. I missed the deadline for this one but I am really pleased with how my card turned out. 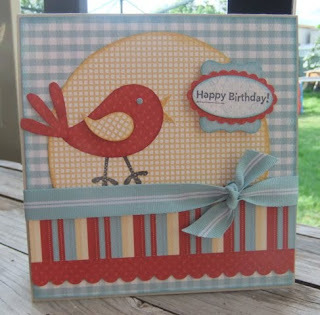 I have used the Good Friend Stamp Set stamped on the back of my patterned paper and cut out so that I could paper piece the little birdy. He is such a cutie. 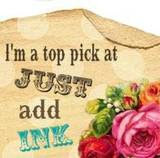 The sentiment has been stamped then punched out with the large oval and layered onto the scallop oval and curvy label punch (hello my name is Lisa and I am a punch-a-holic lol). Gorgeous! Great idea to stamp on the back of your DSP and then cut out - love it. It's a shame you didn't get this linked up, it's so pretty!